ABC Concrete Pumping Service, Inc.
J & V Home Improvement, Corp.
Field Stone Dirt Works Corp. Comment: I would like to get an estimate for installing an 18 round stamped concrete with drain in the middle. Comment: I would like to get an estimate for having a walkway installed in my front yard. I also will need my concrete driveway repaired just part of it. Baldwin Concrete Contractors are rated 4.76 out of 5 based on 392 reviews of 37 pros. 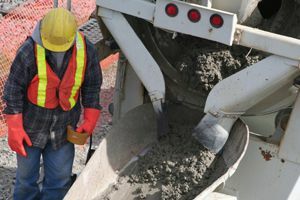 Not Looking for Concrete Contractors in Baldwin, NY?